The traditional method for getting a correct rug size is to have the rug sized to allow just 18″ of space to remain around the perimeter of the room. However, that method has been followed less and less as homes convert over to an open concept. But, if your home is not open concept, this is still a good guideline to use. 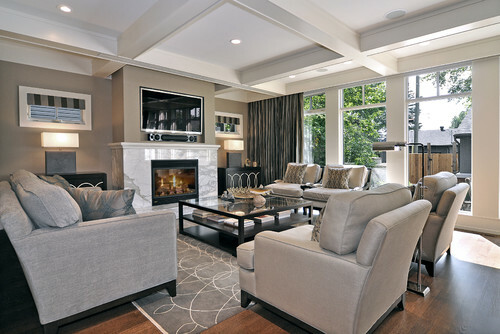 With an open concept, spaces are frequently defined by rugs. So, the rug will be sized according to the area for which it is intended. 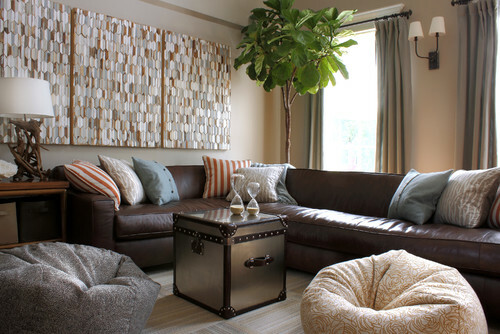 With that in mind, a rug for the seating area should extend beneath the sofa a bit. Some prefer just the front legs resting on the rug. While, others like the rug to extend all the way to the back legs. Either way is fine. However, when attempting to make a small space feel larger, you should avoid chopping the floor space up too much. For bedrooms, a rug should at least extend beyond the edge of the bed by 12″ for a standard size bed, more for a king size. Whether or not the rug extends underneath the bed is a personal preference. Dining room rugs look best with the rug extending at least 24″ past the edges of the table. If the rug does not extend far enough beyond the chairs, it can cause issues with snagging and possibly trip hazards. 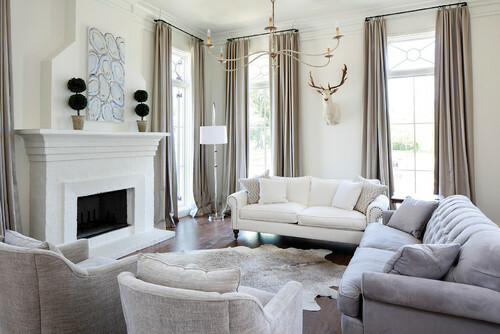 The most important guideline for rugs is to make sure that you do not reduce the space by using rugs that are too small. (unless, of course, that is your intention). With that it mind, it is always better to have a rug that is a bit too large, rather than a rug that is too small. 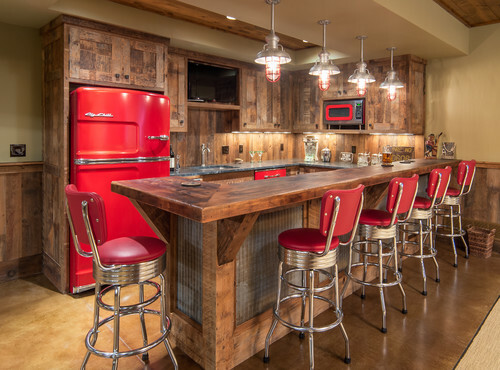 Pendant lights over a kitchen bar work best when they are between 30″-36″ above the countertop, for an 8-9 foot ceiling. This provides a nice ratio between the open space above the fixtures and the countertop. If the ceiling is higher and/or the pendants are large, I prefer them to be at least 40″ above the countertop. Again we are keeping the ratio of space in mind. With larger pendants used in large rooms, this measurement is best. 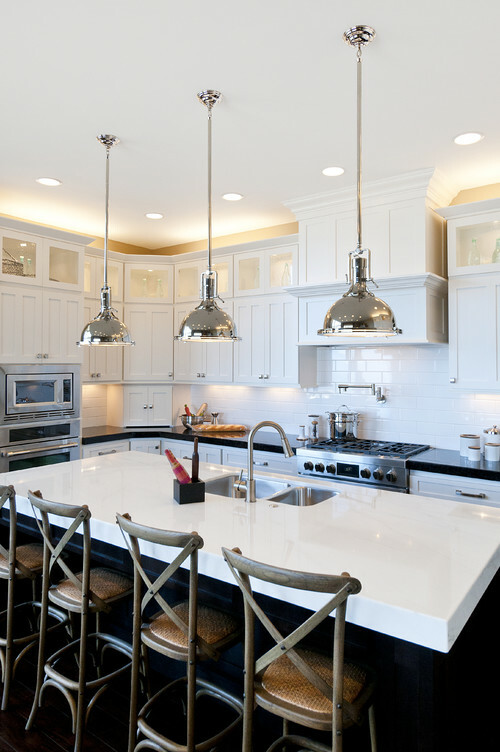 Placing large pendants too close to the countertop can disrupt the natural site line. 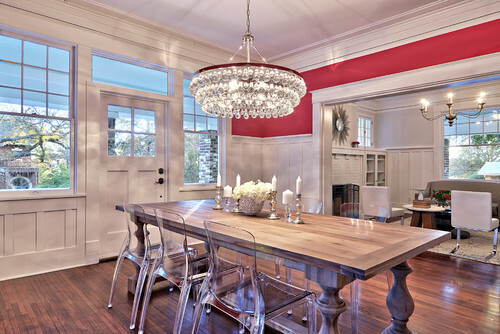 Dining room chandeliers should be approximately 66″ above the floor. Any lower and you run the risk of someone bumping their head into it when they lean forward. Women who are 5’6″ or less should be able to stand beneath the chandelier without it touching their head. 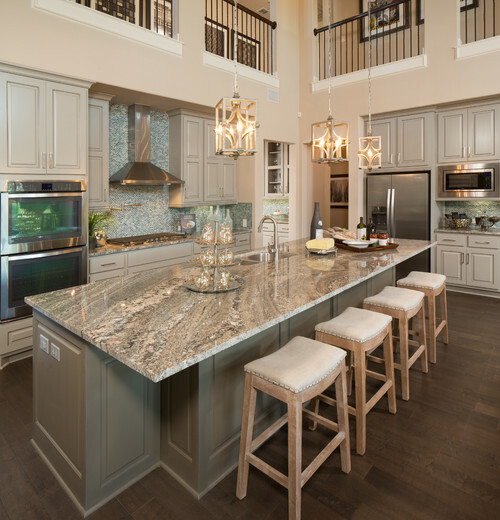 If your countertop height is a standard 36″, your barstools should be 25″ tall. Anything higher and you will end up having your legs crammed against the under side of the bar. If you have a 42″ high countertop, the barstools should be 31″ tall. Make sure that you are purchasing the correct height based on your bar top. DECOR MEASUREMENT GUIDELINES – Window Treatments..
Like just about everything in decor, determining the correct dimensions depends a great deal on what you are trying to accomplish. Windows are no different. But for the sake of this article, I will assume that you want to accomplish the look of tall windows. So with that in mind, drapes/panels should be hung as high as possible. Usually, that means hanging them from just below the crown molding. If you want your curtains to have that puddled effect, make sure to add 2″-4″ of length to the overall measurements. Getting the right placement on window treatments can either make your ceilings look higher or make your rooms look stunted. 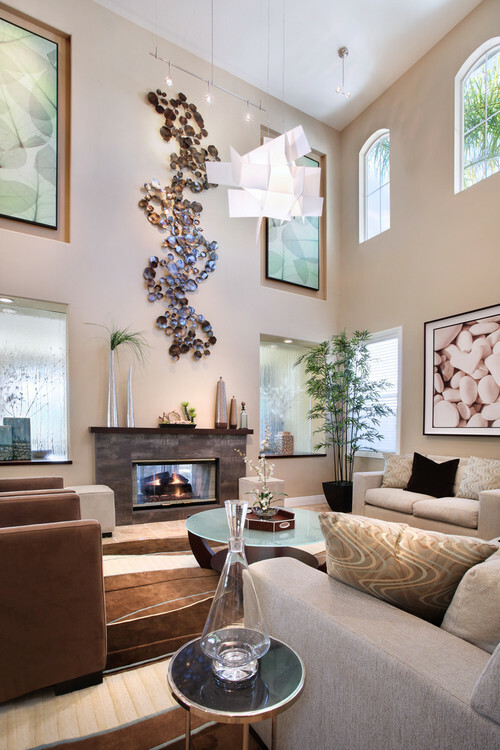 The standard for hanging wall art is for the center of the piece to be between 57″- 60″ high. This guideline works with most ceiling heights (8-10 feet ceilings). It allows the eyes to take in the art in a natural and comfortable fashion. There are a few exceptions though. If your intent is to utilize architectural features that are up high, you can go higher. This will, naturally, draw the eyes upward. Also, when you want to hang artwork for the purpose of viewing from a second floor, artwork should be placed higher. In these instances, you would hang the wall art at the location of center eye level for that floor. As I noted at the beginning, these are guidelines. 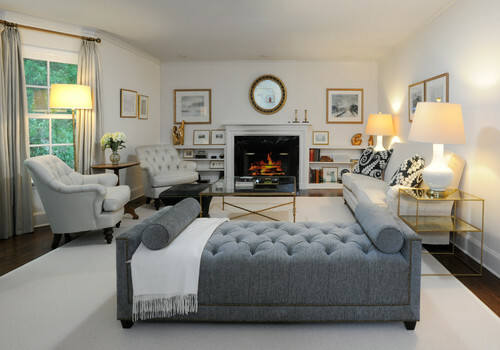 I don’t like to refer to any interior design guides as rules, because, well….. there is always an exception to the rules. But, these guidelines should provide a good starting place for the above items. If you go with these, you can’t go wrong. Of course, don’t feel that you need to stick to these guidelines for every situation.